Je vous avoue que je n’ai pas attendu longtemps avant de tester mon nouveau petit robot. J’avais hâte de voir ce que j’allais pouvoir réaliser avec une contenance un peu plus faible que celle avec laquelle j’ai l’habitude de travailler. Bon par contre, je n’avais pas fait les courses du coup, j’ai improvisé une recette avec ce qui restait dans mon frigo et mes placards, à savoir des oeufs et des éclats de pralin ! Je me suis donc décidée à réaliser de petites meringues parsemées de morceaux de pralin pour leur donner 2 fois plus de croquant. Et pas de panique avec mon kitchenaid mini, la contenance pour réaliser ces petites meringues était parfaite ! I told you on Facebook and Instagram, I am for a year ambassador kitchenaid !!! Imagine the little cries that I pushed to the reading of the mail which proposed to me to receive the new kitchenaid mini as well as several accessories for all to be able to test full recipes! If you want to see who are the other ambassadors of this vintage 2016/2017, go here. I admit that I did not wait long before testing my new little robot. I was anxious to see what I was able to achieve with a capacity a little weaker than that with which I used to work. Good by cons, I did not do the shopping of the blow, I improvise a recipe with what remained in my fridge and my cupboards, namely eggs and bursts of pralin! So I decided to make small meringues strewn with pieces of praline to give them 2 times more crunchy. And no panic with my mini kitchenaid, the capacity to achieve these small meringues was perfect! Déposez la meringue à la poche à douille et parsemez de pralin. Beat the egg whites to the robot with the salt, increasing the speed gradually. Add 2 spoons of sugar, when the eggs are white. Let rise the whites and then gradually add the remaining sugar. 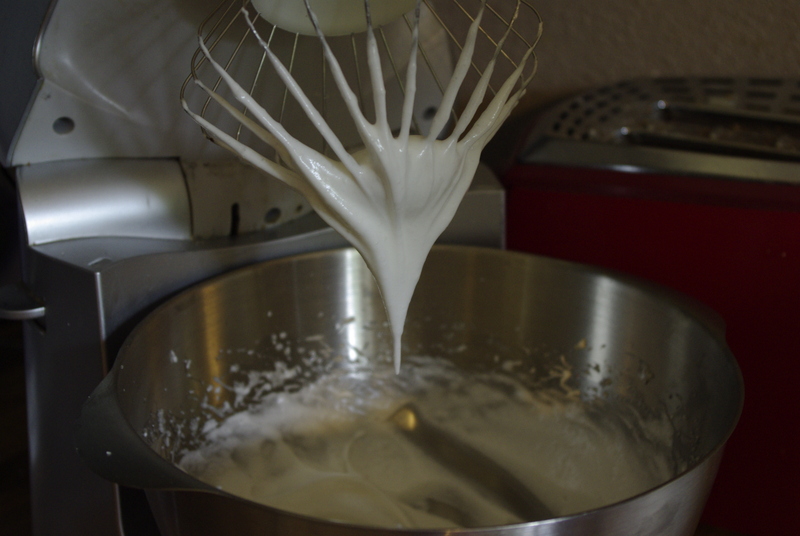 When the meringue begins to stand, add the lemon, without ceasing to beat. Then pour the icing sugar in three times, while continuing to beat (the sugar must be completely dissolved, continue to beat if it is not). When lifting the whip, the whip should form a « bird’s beak ». Place the meringue in the socket pocket and sprinkle with praline. Cook for 1 hour at 100 ° C.
Faites vous livrer du champagne Cattier à la maison !